10% DISCOUNT when you rent for 2 weeks or more in the periods 15/05 - 30/06 and 01/09 - 15/09. 10% when you rent it for 2 weeks or more. In the high season: 150€ DISCOUNT on the total amount if you rent for a period of at least 2 weeks. Jolanda and Theo van Os would like to welcome you at La Grenouille Vacances. 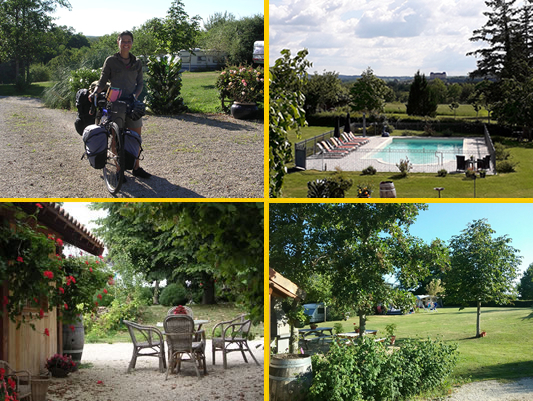 We rent out a small gîte (holiday home) and we have a comfortable small campsite with a big swimming pool near the beautiful village of Hautefort in the Dordogne, France. La Grenouille Vacances is situated on a plateau in the countryside with forests and meadows on the border of the Périgord Noir. There is a fabulous variety of plants and animals in this region. Deer are regular grazers on our land whilst on starry nights you can be serenaded by the frogs' chorus or the hooting of owls. Pure nature – healthy, fresh air mixed with the spicy smell of a rich flora - a place to relax away from the activity of the modern world and recharge your batteries. A little holiday paradise in the middle of nature for those who seek tranquility - though you won't need to miss the modern world as there is a WIFI internet connection. Hautefort, where you can do all your shopping and where there are several restaurants, is only 3km away. Theatre, concerts, markets in picturesque villages or walking trails (120 km of walking trails, some directly starting from our campsite), it is all available within the area. Whether you are looking for rest, space, nature, sport or culture, La Grenouille Vacances is the perfect place to spend your holidays. From 2017 on, Camping and Gîte La Grenouille welcome only adults. Gîtes Saint Germain welcome families with children. Our mini-campsite is open from the15th of May till the 15th of September. The camping is surrounded by forests and meadows. The spacious pitches are well maintained, private and are sunny and shaded. Two pitches are on terraces with a view over our vegetable garden, the goat- and chicken fields and the forest. Another two pitches are situated on a field looking out over the swimming pool and the picturesque countryside with the castles of Hautefort and Badefols d’Ans in the distance and for those who want even more tranquility, there are two lots on the edge of the woods. For those who like the feeling of being alone in the world, there is a third spot on a sunny plateau with stunning views!